Hawaiian Barbecue Chicken Wonton Cups are a must make game day appetizer!! 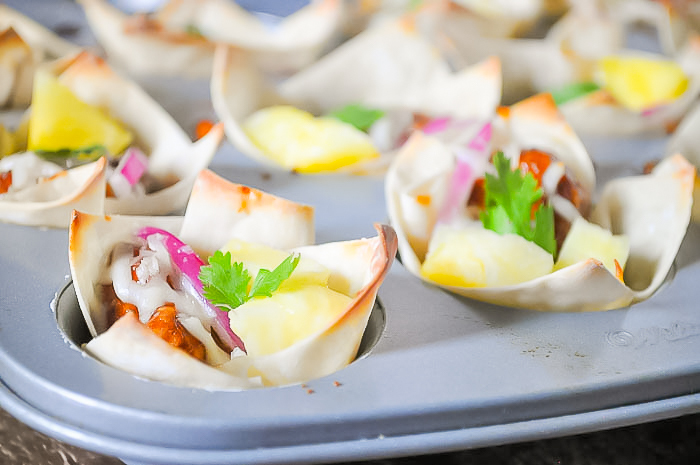 Crisp baked wonton cups are filled with bbq chicken, pineapple, onions, cheese and cilantro for a savory bite with subtle hints of sweet citrus! Hawaiian BBQ Chicken Cups combine the perfect touch of savory and sweet! ‘Tis the season for quick, easy recipes that are perfect for after school snacks or game day appetizers. Emphasis on QUICK! There never feels like enough hours in the day and cooking definitely isn’t as enjoyable these days with a toddler at my feet yelling for my attention, so I love finding appetizer recipes and snacks that come together quickly without sacrificing in the flavor department! I love boneless wings! They are definitely a comfort food for me – full of flavor without the hassle of eating off the bones. While chicken wings are always a winner in our house, I also like to switch up our game food. 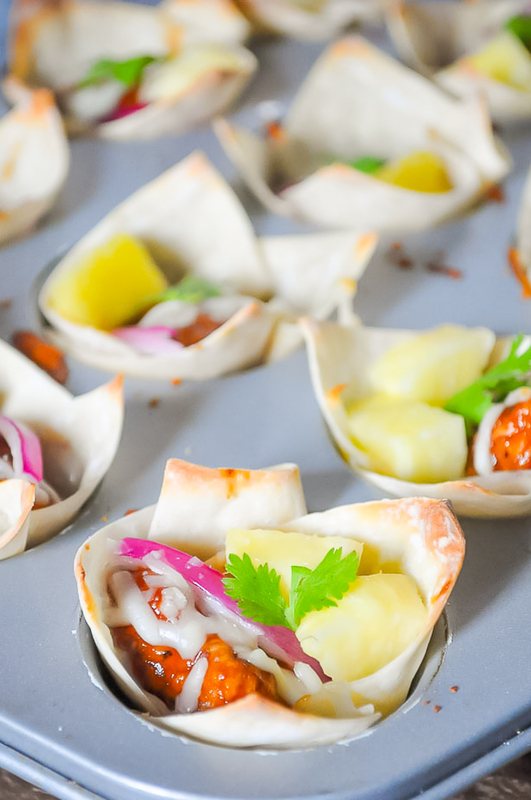 Since we love bbq chicken and grilling pineapple alongside, it seemed like the perfect combination for this wonton cups appetizer. This was my first experience working with Wonton sheets but it definitely won’t be my last wonton cup appetizers. In fact, I have a jalapeno popper wonton cup recipe coming to the blog in the next couple of weeks. Wonton sheets can usually be found in the produce section, in case you have a hard time finding them. To make cups, you need to place one sheet into a muffin tin, slightly overlapping the edges. I made these in a mini muffin pan to serve a larger crowd but these can also be made in a regular muffin pan with extra filling for bigger servings. 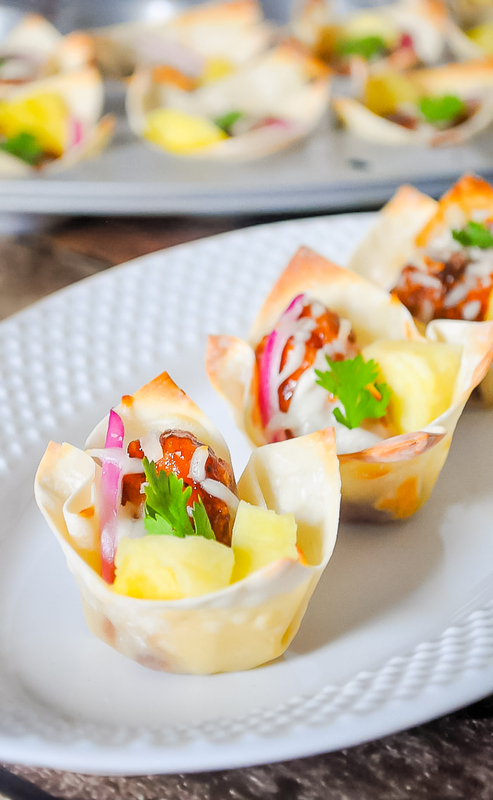 These Baked Wonton Cups with Hawaiian BBQ Chicken Fillings will be a Crowd Pleaser! These baked wonton cup appetizers are filled with bbq chicken, pineapple, onions, cheese and cilantro for a savory bite with subtle hints of sweet citrus! Cook your choice of boneless BBQ Chicken Bites. I used Farm Rich Boneless BBQ Chicken Bites. Spray a mini muffin tin with nonstick cooking spray. Add one wonton sheet into each cup with the corners slightly overhanging. Add a BBQ Chicken Bite and pineapple into each cup. Then top with cheese. Garnish the top of the cups with the diced red onion and cilantro. Enjoy!